On January 14, the Brazosport ISD Board of Trustees unanimously approved moving forward with a $267 million school bond election to address capital needs related to new construction, safety and security, additional career and technical education program opportunities, and renovations to address maintenance and adequacy throughout the district. The development of the $267 million bond referendum follows an extensive process that began with the formation of a Long Range Facilities Planning Committee in August of 2018. This committee, made up of 36 community members, business partners, parents, teachers, students, and administrators, participated in six meetings and a site tour to see firsthand the facility needs of the district. In addition to reviewing facility assessment data, this committee reviewed historical growth and projections, economic indicators, career and technical programming opportunities, early childhood growth plans along with cost estimates and a financial analysis. 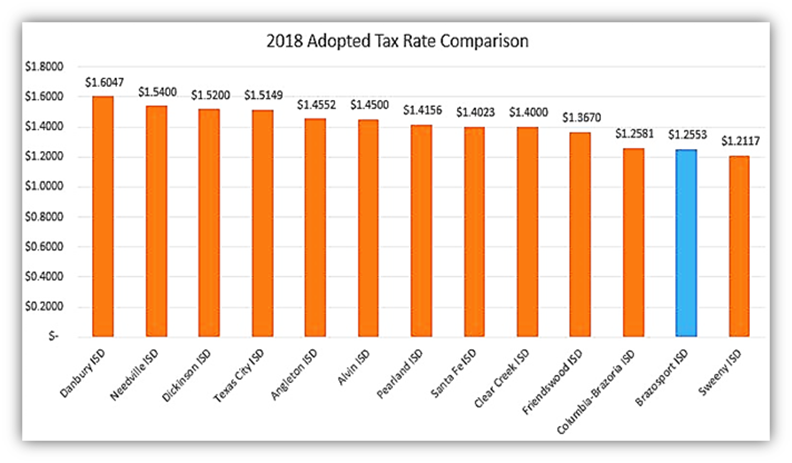 Brazosport ISD holds the second lowest tax rate compared to neighboring school districts. The $267 million proposition can be accomplished within the current tax rate - no tax rate increase! The total tax rate is $1.2553 per $100 of appraised value. With significant industry investments in our area from Freeport LNG, The Dow Chemical Company and ME Global, we have the capacity within the current Interest & Sinking (I&S) tax rate of 0.2153 to issue $267 million of bonds over the next 5 years. Utilization of the capacity from the I&S side of the tax rate is the most efficient use of local dollars as we are able to retain 100% of I&S tax dollars paid here in Brazosport. The Maintenance and Operations (M&O) tax rate is 1.04 and is subject to the State’s Recapture “Robin Hood” system. “This bond provides a unique opportunity to keep local funding for additional course offerings to help advance our students into their future college or career opportunities, as well as a brand new state-of-the art high school, new Stephen F. Austin STEM campus and other district needs, all without raising the tax rate of our stakeholders,” said Danny Massey BISD Superintendent. As the bond election nears, there will be many opportunities for members of the Brazosport ISD community to learn more about the bond program. District administrators are available to answer questions and share additional details about the proposed bond projects. To schedule an informative presentation for your community organization or civic club please call 979-730-7000. Details about community meetings will be shared as plans are finalized. For more information about the 2019 proposed bond please visit our Bond Projects webpage. The election will be held Saturday, May 4, 2019 with early voting beginning April 22-30. You can find a list of Early Voting locations and times below. Have a question about the bond? Just Ask!